The currency in Hungary is the Forint. One forint is divided into 100 fillér. The currency sign is Ft, its international code is HUF. Serbia uses the Dinar. The currency sign is Дин., its international code is RSD. What if my flight's late? Don't worry - just text, email, or call either Esther, Lauren, Marcell or Fabian (find their cell numbers and email addresses here) and get the hotel as soon as you can. In any case, sending texts (SMS) can be costly. Making phone calls is insanely expensive. That’s because of roaming charges. In fact, make sure you set your smartphone so that the data roaming is turned off. If you have a smartphone, we suggest downloading both WhatsApp and Viber. Both let you send texts and make and receive calls via internet when there's a connection - for free. However, these apps also use 3G networks when there is no WiFi connection, and that means data roaming. We tried our best to cater to all your needs and wishes! If there's still something wrong, let us know. Click here for a map of Budapest's metro and suburban railway system! Click here the find information about public transport in Budapest: tickets, prices, maps and journey planner. Tickets can be purchased at a ticket counter, ticket vending machine, or on the buses. Please note that tickets bought on the buses are more expensive than bought from ticket machines! Be sure to validate your ticket before your journey! Taxi: This is, as you may have guessed, the most expensive but easiest way. It will cost you around 8000 HUF and will take you 30 minutes. Cabs are right in front of the arrival gate exit. Public transport: From the airport, take bus 200E (stops directly next to the terminal) and go 9 stops until the end station, Kőbánya-Kispest Metro Station. Take the metro to Ferenciek tere (9 stops). When you come up from the metro, turn to the left, where you'll find the bus stops of several buses going to the direction of Pest (not crossing the Danube river). You can take any of the following buses: 5, 7, 8, 110, 112, 133E, 178. Go 2 stops and get off at Uránia. From there, the hotel is only a short walk: cross Rákóczi street (the main street), turn left at Nagy Diófa utca, and then turn to the right at Dohány street. Budapest has two main train stations, Keleti and Nyugati. Below you'll find the information on how to get to the Zara Hotel from both train stations. When you come out in the main entrance, turn to the left and cross the street to get to the bus stop. From there you can take any of the following buses: 5, 7, 8, 110, 112, 133E, 178. Go 3 stops and get off at Uránia. 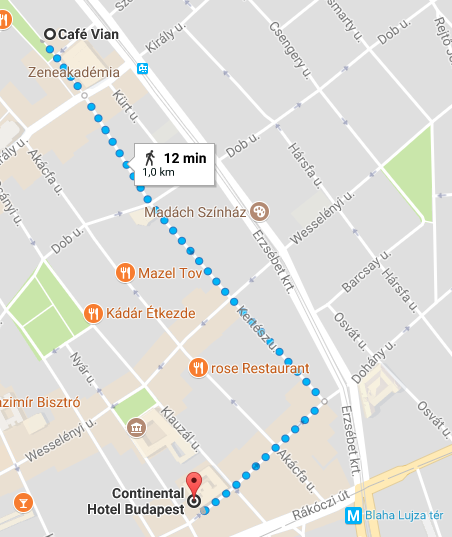 From there, the hotel is only a short walk: turn left at Nagy Diófa utca, and then turn to the right at Dohány street. This journey takes about 15 minutes and costs 350 HUF. Take tram 4 or 6 in direction of Újbuda Központ/ Móricz Zsigmond Körtér. Go 4 stops and get off at Blaha Lujza tér. 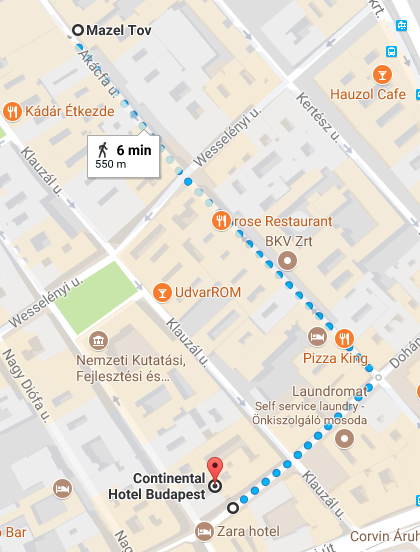 From there, the hotel is only a short walk: turn to the left and walk along on Rákóczi street, then turn to the left at Klauzál utca, then to the right at Dohány street. This journey takes about 20 minutes and costs 350 HUF. Take the metro in direction of Újpest Központ and travel 5 stops until Ferenciek tere. When you come up from the metro, turn to the left, where you'll find the bus stop of several buses going in direction of Pest (NOT crossing the Danube river). You can take any of the following buses: 5, 7, 8, 110, 112, 133E, 178. Go 2 stops and get off at Uránia. From there, the hotel is only a short walk: cross Rákóczi street (the main street), turn left at Nagy Diófa utca, and then turn to the right at Dohány street. This journey takes about 30 minutes and costs 530 HUF (by buying one transfer ticket). 1) Head left on Liszt Ferenc tér toward Dohnányi Ernő u. for 110 meter. 2) Cross the street and continue onto Kertész u. for 650 meter. 3) Turn right onto Dohány u. and after 260 meter you will find the hotel on the right. 1) Head right on Síp u. 2) After 150 meters, turn left onto Dohány u. After 350 meter, you will the hotel on the left. 1) Head southeast on Akácfa u. for 350 meter. 2) Turn right onto Dohány u. and after 160 meter you will find the hotel on your right. 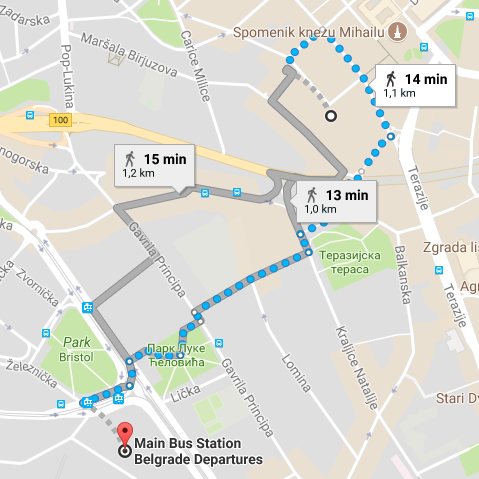 This website will help you find all current Belgrade public transport routes. Using a taxi to get around Belgrade is comparatively cheap by standards of most Western cities. Avoid taking a taxi from one of the taxi stands in the immediate vicinity of major tourist sites (e.g. The Republic Square). Some drivers illegally operate fixed tariff (no meter running) services aimed at tourists which can be several times more expensive than taking a taxi running a meter. Hailing a passing taxi or arranging a pick-up is a far better alternative. A list of operating taxi associations and their contacts can be found here. The price of taxi transport is regulated by the City Authority. At the regular tariff (tarifa 1, figures valid in May 2013), starting a ride costs RSD 170, with each subsequent kilometre charged at RSD 65 and inactivity period at RSD 750 per hour. Between 10 pm and 6 am, on Sundays and public holidays, tariff 2 is applicable - each kilometre is charged RSD 85. Taxi: This is, as you may have guessed, the easiest way. It will cost you around 1500 RSD and will take you between 20-30 minutes, depending on traffic. Cabs can be ordered at the hotel reception. When exiting the hotel, turn right and then turn right on Kneza Mihaila after 80 meter. After 110 meter, turn right at TREFsport onto Sremska. Take a slight right at Tattoo Factory Belgrade onto Maršala Birjuzova and after 35 meters take the pedestrian overpass. After 130 meters take a sharp left at Skroz dobra pekara onto Kraljice Natalije. After 18 meter, turn right onto Jug Bogdanova. You will reach the bus stop in 150 meter. Take bus 72, which departs every 30 minutes, in direction: Belgrade Nikola Tesla Airport - Zeleni venac - Belgrade Nikola Tesla Airport. Ticket price: 150 RSD (if bought in the bus) and the journey will take around 40 minutes, depending on traffic. This is a 15-minute walk. 1) When exiting the hotel take a right and then turn right onto Kneza Mikhaila. 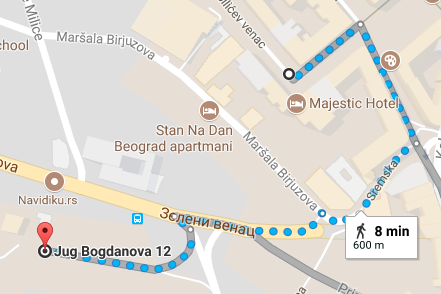 4) After 49 meter, turn left at Apartman Belgrad onto Balkanska and continue walking in this directions for 500 meter. 6) After 140 meter, turn left at Стајалиште код Хотела Асторија to stay on Милована Миловановића. 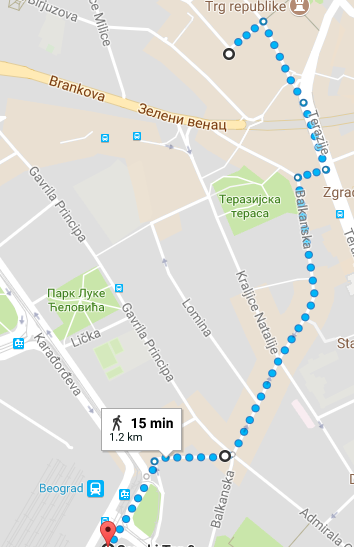 After 31 meters, turn left onto Savski Trg and after 140 meter you will have reached the Belgrade Main Railway Station. This is a 14-minute walk. Take a slight left at Tattoo Factory Belgrade and at Specijal, continue onto Reljina for 88 meter. After 43 meter turn right, you will arrive at the Main Bus Station (Zeleznicka 4) after 84 meter.